Such was the game summary of Wellesley coach Glen Magpiong. 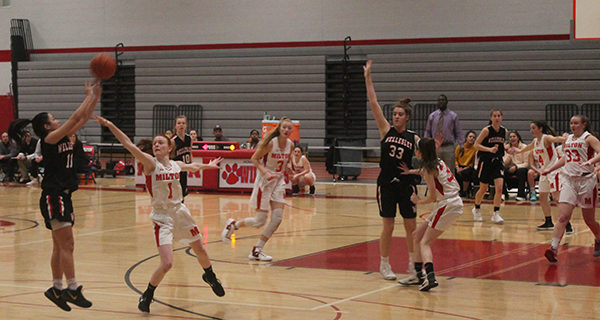 On Friday night, the Milton and Wellesley girls’ basketball teams engaged in an ugly, but fun, tense back-and-forth game that had coaches yelling at refs, fans yelling at players, and players yelling at themselves in frustration. In the end, it would be Wellesley, and their three-point shooters, pulling away for a 36-28 win. Millien was animated throughout, consistently yelling at the referee, who he addressed by the first name “Steve.” At one point, the coach went so far as to shout “Are you kidding me?” about a charge call, and to declare “You’re making it obvious now” about a travel call with which he disagreed. His yelling was only superseded by a fan who consistently bellowed “Let’s go, Raiders,” “play tough, Raiders,” and other motivational chants during the occasional lull in the action. 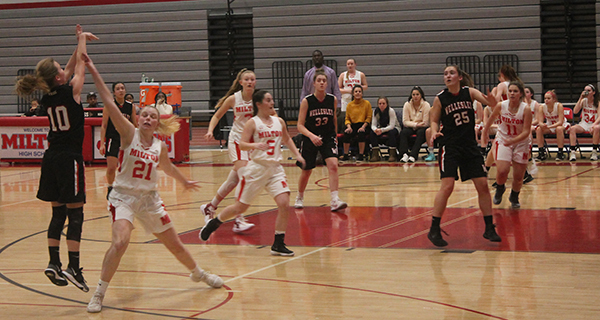 Wellesley led, 32-24, by the end of the third quarter, but the game tightened in the fourth. However, Milton shot themselves in the foot by consistently getting hectic and trying advance the ball quickly when they had a numbers advantage, leading them to throw the ball away a couple of times. A steal from junior guard Anna Glashaw ended the game, after Wellesley took a timeout to calm the team with under a minute left. There was yelling, there were turnovers, and there was some ugly basketball being played - but at the end of the day for Wellesley, there was a win.